Painted by Webber for the 1893 World’s Columbian Exposition, this image celebrates abolitionists’ efforts to end slavery. 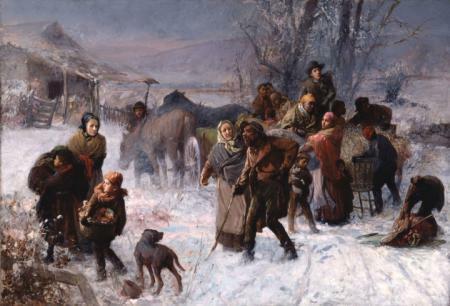 It depicts Levi Coffin, his wife Catharine, and Hannah Haydock, all friends of the artist, leading a group of fugitive slaves to freedom on a winter morning. While most visualizations of the Underground Railroad highlight the the runaway slaves and/or the pursuers as the main characters, Webber focuses on the abolitionists who participated in bringing southern slaves to freedom in the North.